I would like to know some great places to shop in Inner Sydney which are close to railway stations and on bus routes. Mostly looking for Victorian Style Blouses in White or Red. 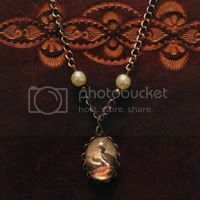 Please list other shops if you think they have interesting clothes and jewelery/accessories. New Music Video "Oh" from Psyche Corp.
Steampunk/cyberpunk band Psyche Corporation (which has been featured in the past on Airship Babylon Radio 102.1 FM in Brisbane) just put out a new music video! It references a dark and bizarre story of a vigilante serial killer. Hope you enjoy! I spoke to the organisers for this and they said they had around 300 people rock up in full Steampunk regalia at their Melbourne show. Anyone up for a little interstate competition? I am writing my first novel and would benefit from some assistance. I have an idea for a character to be based in a library. She is going to be the main character. Any blogs, videos or assistance is greatly appreciated. Hi everyone! I'm one of the organisers of a Live-Action Role-Playing group based in Melbourne. We're called Zeppelin Games and we've been running Steampunk-themed LARP events since 2009. We'd like to invite anybody interested along to our next event! Our LARP events take place over a weekend, with players spending the whole time in the role of either their own character or one supplied by the organisers. We've developed a ruleset which is both fair and full of potential. Games are set in the fictional nation of Fumare, in a fantasy Steampunk world of our own devising. We've had some excellent events so far and we'd really like to push ourselves this next time, so come along and see how you like it! Hi there, my name is Richard Ibrahim and I am a photographer based in Melbourne. I am interested in photographing some Steampunk-ers! If you are interested please contact me at richard@richardibrahim.com. I'm heading away on my OE at the end of the month, and as all my worldly goods will be taking up precious space at my parents' while I'm away, I'm trying to rid myself of some of them. I've got a few of the steampunky pieces of jewellery I've been working on up at my Etsy shop - mostly based around a 'world travel' theme, conveniently enough - as well as various geeky accessories. Nine days until I shut up shop - go and have a look at what's left! Remember, every piece you buy translates to another meal for me. Circus Oz is going steampunk this June/July with their new show "Steam Powered"
Come along in your finest Steampunk attire and step into a time where romance meets technology and everything is hand-made and steam-powered. It’s a time for restoring wonder, for reclaiming technology, re-imagining our modern world and rewiring your wit. Come dressed as the Aviator, the Mechanic, the Inventor, the Mad Musician, Victoriana’s Strongest Woman or a little of all of them mixed together. Bring along your bright shiny gadgets and get ready to let off some STEAM! In added goodness the night they've selected for our special night (Sat 2nd July) is also one of their Auslan shows. 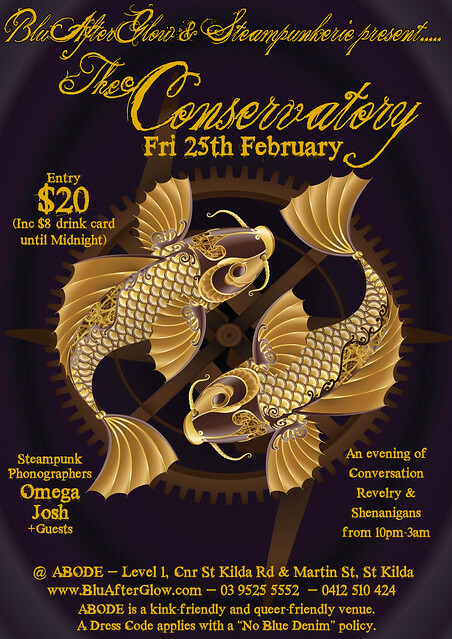 BluAfterGlow and Steampunkerie are pleased to present Melbourne's only regular steampunk nightclub, "The Conservatory". Join us for a night of conversation, shenanigans and revelry as we take over the neo-victorian library lounge of ABODE's first level. 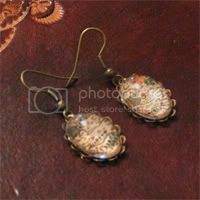 Dress to impress in your steampunk finery and connect with your steampunk community! Relax and socialise in the lounge area or dance the night away on our dancefloor. Enjoy our "Tesla" cocktail or other imbibements with a complimentary $8 drink card if you arrive before the midnight hour. ABODE is a kink-friendly and queer-friendly venue, so you should be too to feel comfortable at this event. -what you want me plugging. If you're local and not flood affected you're welcome to comment, and I'll include you towards the bottom.